1. Medicaid Expansion. 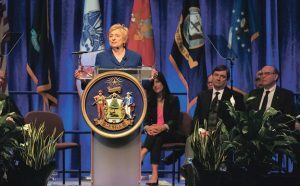 The Governor signed an Executive Order on her first day in office expanding coverage to approximately 70,000 additional individuals in Maine. The untold story, however, is that approximately 20 rural hospitals in Maine will get a much needed boost from these new revenues which will pay for medical care that has for too long been provided without reimbursement to the hospitals. 2. Solar Energy. Governor Mills has promised to restore ”net metering” for solar power. This will provide a renewed boost to the solar power industry and installers, and will help to make solar panels a good economic investment again. 3. “Rural Workplace Grants.” This initiative of the new Governor, if enacted, will provide funds to select rural communities to convert existing buildings into workplace hubs complete with high speed internet. 4. The “Welcome Home Program.” This initiative of the new Governor, if enacted, will promote remote (work-from-home) jobs in Maine by reducing tax and compliance costs for out-of-state employers. 5. Craft Brewing. Governor Mills is proposing to raise the limits of self-distribution to more than 50,000 gallons/year. This should allow tasting rooms to be more profitable and provide a more solid economic base for craft breweries to establish themselves while they build the distribution portion their businesses. According to Chris, these are some of his predictions, and he’ll be watching along with the rest of the state to see what happens. For more on this topic, view the full article from Mainebiz.